Call it fried chicken with a side of sentimentality and a pinch of potential frostbite. Hundreds of people lined up in sub-zero temperatures for the grand opening of the famous Filipino fast-food chain Jollibee's first Canadian location. The Winnipeggers were anxious for a chance to bite into the signature fried chicken or sweet-style spaghetti mixed with ham, ground meat, and hot dog. 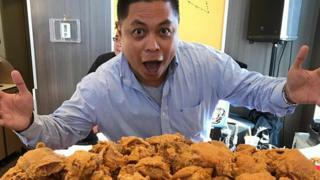 Ron Cantiveros, publisher of the Manitoba Filipino Journal, says that for those who grew up with Jollibee's, the brand's expansion to Winnipeg brings with it a dose of nostalgia. "It's the food, it's the memories we might have had from home, it's the commercials they saw on TV growing up in the Philippines. It's all that." On the streets of the Philippines, Jollibee has a bigger presence than McDonalds or KFC. Globally, the restaurant brand has over 3,000 stores. Jefferson Cortez arrived at 6:00 local time on Thursday to get his spot in the queue, but many had arrived hours earlier, so he didn't expect to be served until lunch time. With temperatures hovering around -25C (-13F), Jollibee set up heated trailers outside of the restaurant so that hungry patrons wouldn't freeze. Winnipeg is home to over 60,000 Filipinos, and Cortez says they all have memories of Jollibee. "Jollibee is so exciting for us because it's part of growing up," he says. Founded in 1975 as a burger shack and ice cream parlour in downtown Manila, Jollibee grew from one store to the ninth-biggest fast-food chain in the world. It has become a point of pride for the large Filipino diaspora. "It's our own, we're proud about it," Cortez said. The company says it chose Winnipeg as its inaugural Canadian location because it has the largest density of Filipinos among any Canadian city. The Filipino language of Tagalog is the second-most common mother tongue spoken here. Jose Minana, who heads up the company's North American operation, said the Canadian expansion plans had been a long time in the works. Jollibee managed to gain a foothold, Minana says, because they make fast-food favourites with the Filipino palate in mind, from the crispiness of the chicken to the sweetness of the spaghetti. But beyond that is the "family values" Jollibee has built into the brand, he adds. "It really has become an icon of hope, an icon of joy in the Philippines. When things don't look too well, it's Jollibee where they go to, to celebrate or feel better," he said, comparing its cultural impact to that of Tim Horton's, a coffee and doughnut chain that has become iconically Canadian. Like Tim Horton's, not everyone agrees the food is worth waiting queuing for. "Is it good? Depends on who you ask," Cantiveros says. "But for those waiting six hours to be one of the first people, I mean, there's a certain nostalgia and craving." Jollibee has further "aggressive" North American expansion plans between now and the end of 2018, including another Winnipeg location, two in the Toronto area, and an Edmonton spot. There are also two US locations planned, one in Jacksonville, FL, and one in Manhattan. Media captionJollibee is the Philippines' biggest fast food chain and is now looking to go global.